Please Join Us for 2019/Afiliarse con nosotros 2019! It is time to join the San Vito Bird Club for the first time OR to renew your membership for 2019! Benefits of membership include bi-monthly Bird Walks at the Wilson Garden/OTS Las Cruces Biological Station, invites to the members-only Annual Meeting at Cascatas Del Bosque, day trips in and around the Coto Brus Valley and occasional overnight jaunts throughout Costa Rica in search of rarities like the Lanceolated Monklet. Plus your membership support helps us bring BirdSleuth-International, an environmental education program from the Cornell Laboratory of Ornithology, to local schools as “Detectives de Aves”. Please read President Wendell’s post about the Detectives de Aves year 2018 here. Part of your membership dues will be donated to the Organization for Tropical Studies Las Cruces Biological Station that provides us with an exciting place to bird and free coffee and camaraderie after the walks. We are keeping dues at 2018 rates: C11,000 or $20 per person for International Members and C14,000 or $25 per person for residents of Costa Rica. Family membership are priced for two people but always include children. Without you, we are nothing so please join today! You can give your dues to Peter at the Bird Walk on December 9 or to Randall Bourbon Jimenez or to any other executive committee member: Greg Homer, Alison Olivieri or Harry Hull. NOTE: This is a re-post, combining two earlier posts on this subject into one. Windows kill birds; there is no doubt about that. In a popular book called Pete Dunne on Bird Watching, Daniel Klem, a professor of biology at Muhlenberg College in Muhlenberg, PA, estimates the number of birds killed by striking sheet glass per year at between 100 million and one billion birds in North America alone. Dr. Klem has studied this hazard for more than 25 years. 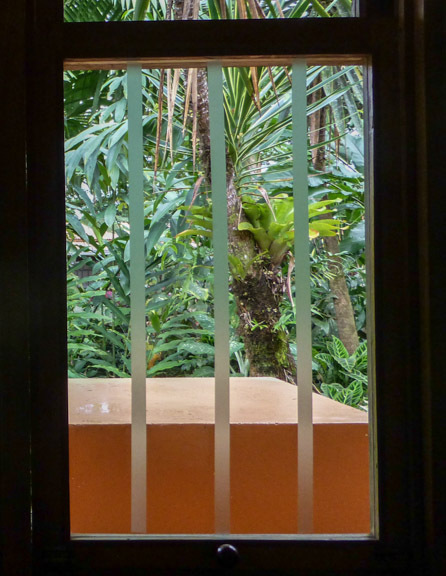 We did not come to Costa Rica to kill birds; however, in our rush to build a house with a view, we have done just exactly that. Every time we hear the sound of a bird hitting a window in full flight, our hearts sink. In searching for a mitigation device, we’ve visited many websites by Googling “Window Kills Birds” and, as you might expect, this troubling problem has generated many sources of information. 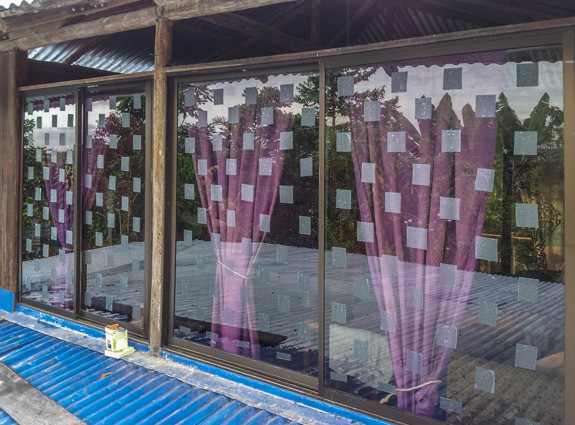 ABC Translucent Window Tape to protect birds. Photo by Alison Olivieri. 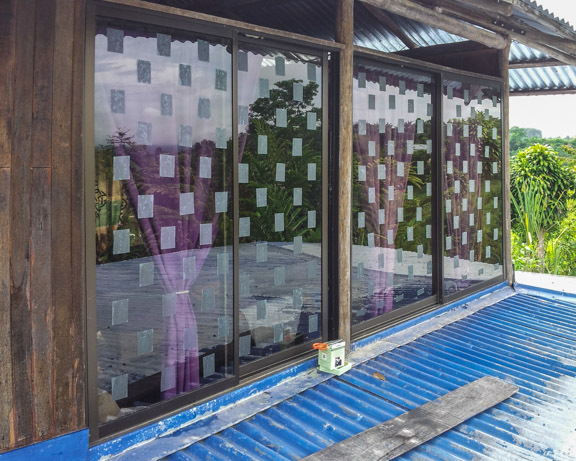 Recently, we purchased translucent tape in two sizes from the American Bird Conservancy and have applied the thin strip type to one of our kitchen windows. For more than a month this window has been bird-collision-free. Click here for more information on this product and other ways to reduce collisions suggested by the ABC. Continuing this experiment, Roni Chernin, a ‘Detectives de Pajaros’ teacher and birding companion, has just decorated her large windows with the wide kind of ABC Translucent Tape. We will wait to hear about the success of her efforts. If you’d like to try putting this tape on one or some of your windows, please CONTACT US . We would be more than happy to lend you our tape and will be buying more on our next trip north. Thick ABC Translucent Window Tape to prevent bird strikes. Photo by Roni Chernin. Creative solutions continue to arise, addressing this issue. For new construction projects, we found a product called Ornilux Bird Protection Glass. Manufactured by a company called Arnold Glas in Germany, it is patterned with a UV reflective coating that birds can see but, apparently, humans cannot. Lisa Welch who works in the Ventura, CA office of Arnold Glas told us recently there is no Costa Rican distributor but it is available to be shipped here. If you or anyone you know wants to try to reduce window kills, contact her at: lisa.welch@arnold-glas.de for more info. Please let us know if you find ways to prevent this problem that we have not, as we’d like to be in the business of protecting birds, not killing them! Las ventanas matan aves; no hay duda de eso. En un libro popular llamado Pete Dunne on Bird Watching, Daniel Klem, un profesor de biología en Muhlenberg College en Muhlenberg, PA, ha estimado el número de muertes por estrellarse con una ventana entre 100 millones a un billón de aves por año en norte America solamente después de estudiar este fenómeno por más de 25 años. No hemos venido a Costa Rica a matar aves; sin embargo en nuestro apuro por construir nuestra casa con una vista, hemos hecho exactamente eso. Cada vez que escuchamos el sonido de un pájaro chocando con nuestra ventana en pleno vuelo, nos da mucho desconsuelo en nuestros corazones. En busca de un dispositivo que mitigue estos accidentes, hemos visitado muchos sitios web a través de google buscando con palabra clave ’’Ventanas que matan las aves’’ y como ud podría suponer, este tipo de problema ha generado muchas fuentes de información. Thin ABC Translucent Tape to protect birds. Photo by Alison Olivieri. Recientemente, compramos cajas de cinta translucida en dos tamaños de la entidad American Bird Conservancy y hemos aplicado una delgada tira en una de las ventanas de nuestra cocina. Por más de un mes esta ventana ha sido una ventana libre de colisiones. Presione aquí para obtener más información de este producto y también otras formas o sugerencias para reducir las colisiones en las ventanas hechas por la ABC. Roni Chernin, una “Detectives de pájaros’’ profesora y aficionada a las aves, ha decorado sus ventanas más grandes con la misma cinta translucida pero esta vez la versión más ancha promocionada también por la ABC. Esperamos pronto escuchar noticias del éxito de sus esfuerzos. Thick ABC Translucent Tape on large windows. Photo by Roni Chernin. Si le gustaría a alguno de Uds. poner esta cinta en alguna de sus ventanas, por favor CONTACTENOS. Estaré más que feliz en prestarle un poco de nuestra cinta y estaré comprando más en nuestro próximo viaje al norte. Nuevas y creativas soluciones están surgiendo para solucionar esta problemática. Para nuestro proyectos nuevos de construcción, encontramos un producto llamado Ornilux Vidrio Protector de Aves. Manufacturado por una compañía llamada Vidrio de Arnold en Alemania, esta patentado con una cubierta reflectiva Ultra violeta (UV) que aparentemente las aves pueden ver, pero que los humanos no pueden. Lisa Welch quien trabaja en Ventura, CA oficina de Arnold Glas nos dijo recientemente que no hay un distribuidor Costarricense pero que podría mandarse sin problemas. Si Ud. o alguien que conoce quiere tratar de reducir este tipo de muertes, contáctenla a lisa.welch@arnold-glas.de para más información. Por favor, déjenos saber si encuentra o ha encontrado alguna forma de prevenir este problema que no hayamos ya encontrado ya que nos gustaría estar en el negocio de protección de las aves, no matarlas. 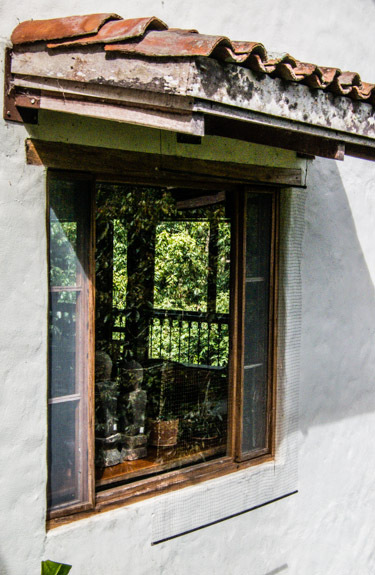 In response to the post above about the dangers of windows to birds (Why, At Times, We Hate Our Windows), we’d like to pass on a simple and relatively inexpensive solution that Karen Arras has developed for her home near El Roble de Heredia in Costa Rica using plastic netting hung from eaves in front of windows. 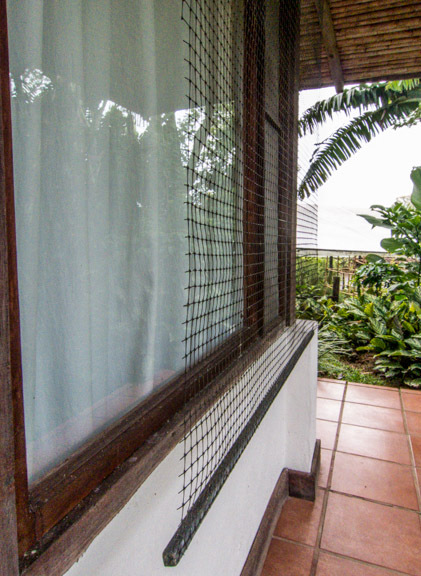 A screen made of plastic netting or mesh hung in front of a window to protect birds. Have you noticed that birds never hit windows with screens? For windows that don’t have screens, I use plastic netting or mesh as thin as possible with squares of about 1/2 inch to make what in essence are hanging screens. 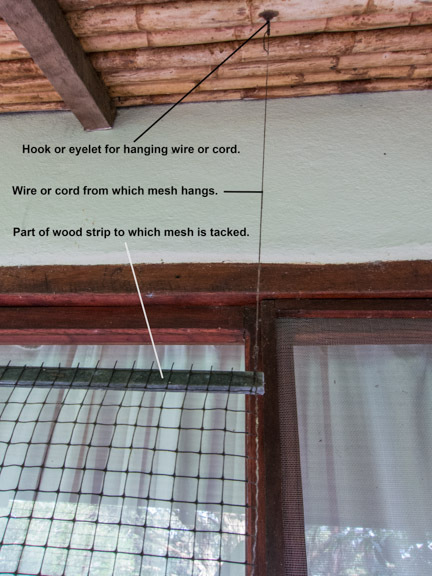 To make a hanging screen, measure your window, cut the plastic netting to a size that covers it, and staple this to two thin strips of wood on top and bottom. Add two eyelets to the top piece of wood, one near each end, and hang the entire screen with nylon cord or thin wire from your eaves. 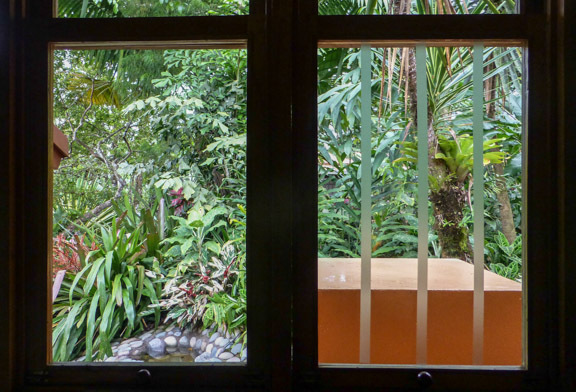 If the window opens outward, hang the screen far enough away from the window to allow you to open it easily. Otherwise, hang the screen a minimum of 6 inches away from your window. Avoid using a heavy material for the top and bottom of the screen; otherwise, a constant wind might set the whole screen swinging enough to hit and damage the window. If the window is wider and taller than the width of the netting, use two or more pieces of netting to protect the window. This system has been very effective and low maintenance. We’ve never had a bird get caught in the screen, so I think the mesh of the screens is large enough not to snag birds. A special thanks to Karen and Rob Arras for sharing this great idea. All photos by Harry Hull. 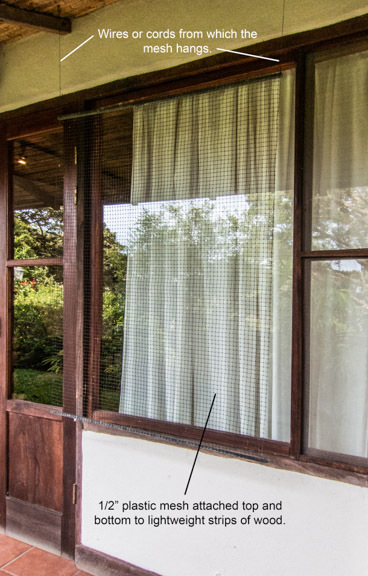 Another example of a screen of plastic netting hung in front of a window to prevent birds from hitting the window. Dear SVBC members and friends. We have gathered on this web page to mourn the loss of two beloved species which recently died at the hands of the North American Classification Committee (NACC). The American Ornithology Union (AOU) has published the list of taxonomy changes for 2018, and we in the Southern Zone have lost two species. They are still around, thank goodness, but have been reclassified as members of another species. Our local Cherrie’s Tanager and the Passerini’s Tanager are once again lumped together as one species. They are both known again as the Scarlet-rumped Tanager (Rampocelus passerinii). The Masked Yellowthroat, which we have seen during our walks at the San Joaquin wetlands, is now lumped together with, and now known as, the Olive-crowned Yellowthroat (Geothlypis semiflava). Fortunately, we also have two new species to celebrate. The Buff-throated Foliage-gleaner was split, and the species in our area, the Chiriqui Foliage-gleaner (Automolus exertus), is named for the Panamanian canton which is a large portion of the range of this new species. The White-collared Seedeater was also split, and the Costa Rican species is Morelet’s Seedeater (Sporophila morelleti), named for the person who first found the original species in 1885. The species that occurs in areas north of Costa Rica is now the Cinnamon-rumped Seedeater. Additionally, the Mouse-colored Tyrannulet has had its scientific name changed from Phaeomyias murina to Necotriccus murinus. Finally, I implore the AOU and the NACC to stop picking on the Red-breasted Blackbird. Last year they changed its scientific name to Leistes militaris, and this year they have changed its English common name to Red-breasted Meadowlark. Please update your field guides to reflect these changes. Happy birding to you all! Why Are They Called ‘Ant’-Birds? Antbirds–Ant Tanagers–Antvireos–Antshrikes–Antpittas–Antwrens–Antthrushes? Why are so many Costa Rican bird species modified with the word ‘Ant’ in from of them? Most people have the misconception that all of these various species of ‘Ant’ birds are consumers of…ants! This is not the case (although some birds, like the Northern Flicker woodpecker, do consume ants with gusto). These birds are called ‘Ant’ birds for another reason. ‘Ant’ birds are given this prefix not because they eat ants; but rather because they FOLLOW ants, in particular Army Ants ( most often Eciton burchellii). If you live or have visited the neo-tropics you may have had the opportunity to observe Army Ants on the move. Hundreds of thousands, perhaps millions of these tiny marauders will sweep through an area not unlike…an army! Along their march the Army Ants attack and kill pretty much anything they encounter. Invertebrates and even small vertebrates probably fear nothing more than being swarmed over, torn apart and ultimately eaten by Army Ants. And so, when an army of Army Ants is discovered by the beetles, crickets, worms, centipedes, lizards and even small snakes of the forest floor they do exactly what you or I would do; GET THE HELL OUTTA THERE! And guess who takes of advantage of this Army Ant-induced mass-panic? Correct; our ‘Ant’ birds! A swarm of Army Ants creates a delicious and nutritious movable feast of beetles, crickets, etc. for the ‘Ant’ birds who hover above the swarm and simply wait for movement. FYI: If ever you find yourself in swarm of Army Ants…do not panic; simply move out of their way. Army Ants are blind and stay in contact with their kin through a pheromone trail left by the ant in front of them. But they can bite! Also, take some time to look and listen for some bird species you rarely get the opportunity to see; the ‘Ant’ birds. As we observe the photo below more closely we notice a few interesting features of these Oropendola nests. Let’s put on our Deductive Reasoning Caps and ask ourselves, ‘Why?’. Why are the nests constructed very high up in an isolated tree? Why do the nests seem to be hanging from the extreme distal (furthest from the tree) part of the branches? Why do the nests all seem to be on just one side of the tree? And lastly, why are the nests communal? Over countless generations, Crested Oropendolas have found this particular lifestyle to be the most successful for them; the best way ensure that their genes are passed on to another generation. All organisms do the same; we call this Population Dynamics or Population Ecology. FYI: These questions are merely rhetorical and posed just for fun. No homemade cookies for the best answers. Watch this video of Detectives de Aves in Guatemala! Mira el video de Detectives de Aves en Guatemala! Because Detectives de Aves is THE most exciting program sponsored by the SVBC, we decided to re-post this 7 minute video from the Cornell University Laboratory of Ornithology — they hit it out of the park with this short film! In April, two of our teachers — Carla Azofeifa and Paula Mesen — went with SVBC President Peter Wendell to the highlands of Guatemala to share teaching experiences and learn from indigenous teachers Vilma, Gilda and Norma. It’s just a GREAT program and we are proud to play a part. In this presentation, those of you who don’t live here will meet Carla Azofeifa and Paula Mesen, two of our wonderful teachers! Please consider sending a donation to continue this program in local schools by visiting our Support the Club page. Ya que Detectives de Aves el EL programa más emocionante patrocinado por el SVBC, decidimos volver a postear este video, de 7 minutos, del Laboratorio de Ornitología de la Universidad de Cornell. ¡Realmente se lucieron con este corto video! En abril, dos de nuestras maestras Carla Azofeifa y Paula Mesén, fueron junto al Presidente del SVBC, Peter Wendell, a las tierras altas de Guatemala para compartir sus experiencias de enseñanza y aprender de las maestras indígenas Vilma, Gilda y Norma. Vilma y Norma nos devolveron la visita en mayo, cuando vinieron junto a Tara y Rob Cahill, de la Cloud Forest Conservation Society, para participar en nuestras escuelas locales en San Vito. Estos viajes fueron financiados mediante una donación del Dr. Lilly Briggs de National Geographic (vea el reporte aquí). Why is our Detectives de Aves (Bird Sleuth) education program so very, very successful? On a sunny morning in early November, Pepe Castiblanco and I went to look for a bird that had never been recorded in Costa Rica until it was discovered in October. Most followers of this website know Pepe but, in case you do not, he is a birder, natural history guide, musician, raconteur, photographer, baker, restaurateur and co-owner – with his wife Kata Ulenaers — of a nearby B&B. Pepe’s friend, Juan Abel, who is dashing and works at the Organization for Tropical Studies as a forest guard, found this bird – a Flame-rumped Tanager – on his finca, consorting with a group of Cherrie’s Tanagers. He called some friends, extraordinary birders, to come take a look and so it went. Because this is private property, the search becomes a question of permission. We were grateful to have a chance to go look and got lucky with the bird. Juan and his wife Ruth have a large, enthusiastic dog that lunged through the door as we pulled into the driveway. Before we were able to get out of the car, the dog clipped one of Juan’s sons’ legs, sending coffee dribbling all over its back, and climbed into the car onto my lap. It was an auspicious start. We walked around the house, through a guava orchard. The trees look odd because each round, fat fruit is sequestered in a bag to stymie insects and birds. The Abels have chicken coops and banana feeders and a ring of old trees around their farm. We saw four Rose-breasted Grosbeaks taking the sun in a pine tree and heard woodpeckers and Slaty Spinetails churring from the woods. After a bit, Hafjeth Abel, 19, joined our search party while he fed the chickens, steering us away from making hopeful glances at their banana feeder. The group of tanagers we were after apparently does not frequent the feeder but hangs around the other side of the property near the forest edge. Over we went and suddenly they arrived, sputtering and squeaking, with the Flame-rumped female in plain view, perched for Pepe’s camera. Two Yellow-billed Caciques came out of the forest — an uncommon sighting as they are more often heard than seen. The new tanager comes with some confusing taxonomy. It has three common names: Flame-rumped, Lemon-rumped and Yellow-rumped. And two scientific names: Ramphocelus flammigerus and R. icteronotus plus a subspecies indicator like this: Ramphocelus flammigerus icternotus. You can consult the authority of your choice, but the Asociación Ornitológica de Costa Rica follows the American Ornithologists Union checklist so this one is being presented to the Rare Records Committee as Flame-rumped Tanager, Ramphocelus flammigerus. Maybe another one will join it or show up elsewhere. We will try to keep ourselves updated and report back from time to time. Juan Abel, standing back row center, found a new bird for Costa Rica in October 2017. Also pictured Pepe Castiblanco, standing right. Photographer unknown. Una mañana soleada de noviembre, Pepe Castiblanco y yo salimos a buscar un ave que nunca había sido registrada en Costa Rica, hasta que fue descubierta en octubre. La mayoría de quienes siguen este sitio web conocen a Pepe, pero en caso de que usted no lo conozcan, él es un pajarero, guía de historia natural, músico, anecdotista, fotógrafo, panadero, restaurador y co-propietario – con su esposa, Kata Ulenaers, — de un B&B de la localidad. El amigo de Pepe, Juan Abel, quien es gallardo y trabaja para la Organización para Estudios Tropicales como guarda, encontró esta ave, Flame-rumped Tanager, en su finca, compartiendo con un grupo local de sargentos. Juan llamó a unos amigos, pajareros extraordinarios, para que vinieran a ver. Dado que esta es una propiedad privada, la búsqueda se convierte en una cuestión de permiso. Tuvimos la suerte de tener la oportunidad de ir a observar y encontrar el ave.
Juan y su esposa, Ruth, tienen un perro grande y entusiasta que se lanzó a través de la puerta mientras nos parquéabamos. Antes de que pudiéramos salir del carro, el perro atrapó una de las piernas de un hijo de Juan, echándose el café sobre el lomo, y se encaramó en el carro hasta llegar a mi regazo. Un prometedor comienzo. Caminamos por la casa, hasta llegar a una plantación de guava. Los árboles se ven extraños porque secuestran su fruto en una vaina, para protegerlos de aves e insectos. Los Abels tienen gallineros y alimentadores de aves, y un anillo de árboles viejos alrededor de su granja. Vimos varios Picogrueso Pechirrosado (Calandrias) tomando el sol en un pino y escuchamos carpinteros y Arquitectos Plomizos en el bosque. Después de un rato, Hafjeth Abel, de 19 años, se unió a nuestra búsqueda mientras alimentaba las gallinas, alejándonos de echar miradas esperanzadas al alimentador. Aparentemente, el grupo de tangaras que estábamos buscando no frecuenta el alimentador, sino el otro lado de la propiedad, cerca del lindero del bosque. Fuimos ahí y llegaron, chillando y revoloteando, con la hembra Flame-rumped a plena vista, en una posición privilegiada para la cámara de Pepe. Dos Caciques Picoplata salieron del bosque, una observación entraña, ya que frecuentemente se los escucha más de lo que se los ve. La nueva tangara viene con una taxonomía confusa. Tiene tres nombres comunes: Flame-rumped, Lemon-rumped y Yellow-rumped; dos nombres científicos: Ramphocelus flammigerus y R. icteronotus; y un indicador de subespecie: Ramphocelus flammigerus icteronotus. Usted puede consultar con la autoridad de su escogencia, pero la Asociación Ornitológica de Costa Rica sigue el listado de la American Ornithologists Union, así que esta especie está presente en el Comité de Registros Raros como Flame-rumped Tanager, Ramphocelus flammigerus. Quizá otra se le unirá o aparecerá en otro lugar. Trataremos de mantenernos al tanto y reportarle de cuando en cuando. the obvious blue patch on the throat.